I had really hard time choosing Monster number three, so I thought why not make this an ode for two Spanish-language movies: Guillermo Del Toro‘s Pan’s Labyrinth (El laberinto del fauno) and Juan Antonio Bayona‘s The Orphanage (El orfanato), both brilliant films. The Orphanage is a genuine horror film, and Pan’s Labyrinth, though scary, is more of an allegorical dark fantasy. 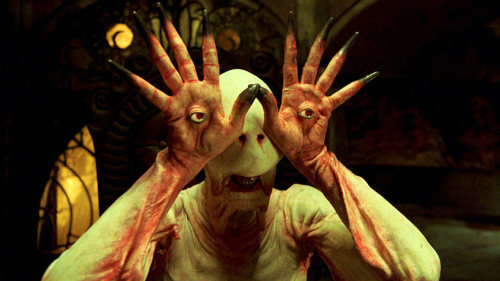 Pan’s Labyrinth (2006) is one of my all-time favorite films. The story is told from the point of view of a young girl during the aftermath of the Spanish civil war, weaving together fantasy with the brutality of war. The fantastical elements in the film are not polished and pretty; even the fairies are almost frightening and insect-like. At the same time the “real world” with its very real violence is in many aspects much more frightening than the fantastical creatures ever can be. The Pale Man appears in the film for a short time only, in a sequence set in an underground cellar, but he is one of those creatures that will not be easily forgotten once you’ve seen him. The design of the Pale Man is unique with his hands for eyes anatomy, and I also love how the film builds the tension in the scene: We see him just sitting perfectly still by a table with the disturbing knowledge that he might soon move. The second film I wanted to mention (and Monster #2.5!) is The Orphanage (2006). It’s an amazing horror film and I don’t think I have seen anything this well done in the horror genre for a long time. The Orphanage is all about mood, atmosphere, mystery and suspense – not about jump scares or violence. One of the most frightening elements in the story is the character I call the Bag Head Boy (though he does have a name too, Tomas) – who to be fair, is not really a monster in the traditional sense. There is something really frightening in not seeing a person’s face which makes the imagination fill in the blanks, creating the best experience of horror – fear of that which we can’t see or yet understand. If I had to recommend one film for this Halloween, The Orphanage would definitely be it. It’s masterfully written, beautifully filmed, and enjoyable for those who are not huge horror fans (no blood and guts in this one). 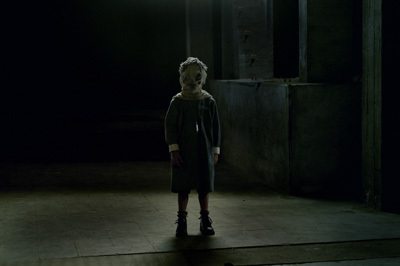 The horror of The Orphanage is subtle and psychological and does not rely on cheap scares, making it a solid classic. Two more scary monsters to go and Halloween is here in a few days… yikes! I have been told numerous times that if I were born a man, I’d be Jeff Goldblum. 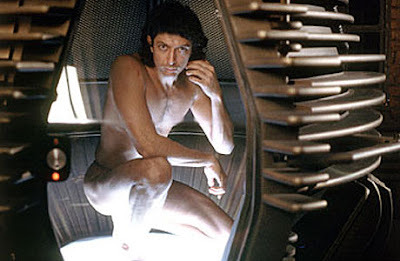 So I guess it is understandable why a movie where Jeff Goldblum’s skin, teeth and fingers fall off has convinced me of two things; 1) I should never build a teleportation device (dammit! just what I wanted to do! ), and 2) I should never go inside one. In fact, it might be best for me to avoid all egg-shaped devices altogether, including suspiciously shaped rice cookers and certain espresso machines. And kill flies. David Cronenberg’s The Fly (1986) tells the story of a young scientist Seth Brundle (Goldblum) who accidentally fuses his genetic material together with a common housefly, the result being the Fly – a horrific half man, half fly. A Brundlefly, as he calls it. 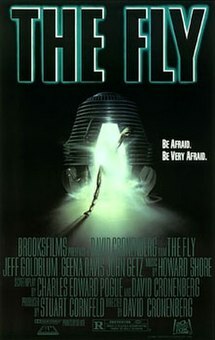 The horror of the Fly comes from the graphic transformation and the physical and mental pain it induces on Seth’s character. The metamorphosis into a revolting insect, though very kafkaesque, makes us wonder where man ends and beast begins – and how thin that line can be. At first the mutation seems to have an almost positive effect on Seth, causing increased strength, stamina, sexual drive, and heightened senses. But as the change advances, he begins to lose some of his more human traits such as his ability to speak, sense of empathy, and ability to think logically. … And in the mid-stages of his transformation (…or after a particularly rough night out). Seth’s mental and physical deterioration into the Fly is a disturbing, frightening and emotionally demanding journey to watch. By combining what we view as the ‘highest life-form’ (humans) with the very lowest (an insect), the film takes the idea of metamorphosis into a terrible and grotesque end. And it teaches a valuable lesson too, especially for eccentric scientists: If you are planning to teleport yourself, please do yourself a favor and use insect repellent in the pod before you press go. Okay, so that’s it for monster number 4, hope you enjoyed it and like the film – three more to go before Halloween! Directed by Neil Marshall (Dog Soldiers, Centurion, Game of Thrones Season 2 Finale), the film follows a group of women who go caving together a year after one of them tragically looses her family in a car accident. What I enjoyed especially in this film is that it manages to avoid all the typical clichéd horror stereotypes by relying on credible, likable characters who are skilled, warm and fun. The six women are a group of genuine friends who have a history together, some of them being more tight-knit than others. By the time things start to go wrong, we truly care what happens to the characters. I also enjoyed that all the women come across as ‘real’ – none of them are overly bossy/girly/helpless/fussy/courageous, and depending on the level of their desperation, react as any normal person might. They panic, they fight, and they care of each other. Now on to the crawlers, the monsters of the film. The movie creates the feeling of being trapped inside the cave system, in the dark, deep deep underground, making the crawlers an organic part of the cave itself. For us, the cave is moist, black and claustrophobic, but for them, it’s home. The reason why I rate the crawlers so high as on-screen monsters is definitely not because of the gore (though there’s quite a lot of it in the film) but the fact that they come across as real. The design of the creatures looks exactly how I’d imagine humans would look like if we had developed in caves, out of sunlight; pale and blind. The crawlers come in different shapes and sizes – male, female and children – which is quite rare in creature films, and this makes them much more interesting. Looking back at how they attack and why, it’s clear they are defending their territory against intruders. In my opinion, this an important quality for an on-screen monster: They don’t attack because ‘they just are vicious and mean’ – There’s logic to why they behave the way they do. The film takes its time to build tension and by the time we get to see any of the creatures, we already care deeply about our main characters’ survival. The crawlers are strong but not supernaturally strong, and they can be killed – there is chance for survival for our characters, a real chance. The crawlers are blind but have excellent sense of smell. Not all of them are as strong as others. We also get to see how they live and feed. In short, these are monsters that very well could exist, and looking at where they live, it makes sense why no one has ever seen them. This makes them particularly frightening. Going into The Descent as an adventure film, not knowing what to expect, is probably the best horror film experience one could have. The first half of the movie is very much like an adventure film and then when the monsters finally do appear, they create such a great twist from adventure to terror. One thing worth mentioning is that the film is available with two different endings; one being the UK original, and the other an altered ending targeted for the U.S markets (which basically ends the story on a more positive note). I first saw the film in the US cut and later watched the original ending on YouTube, which in my opinion is better and more impactful. The Descent is a tale of lowering into the womb of the Earth, through canals and passageways. As monsters, the crawlers really succeed in portraying the violent ugliness of the depths that need to be faced before a literal and metaphorical rebirth from darkness into light. They are the messengers of the abyss that along with the film’s storyline of mental survival and revenge, make a wonderful and very scary experience. I recommend watching this film in the dark, alone or with a friend, but definitely not before dinner. With Halloween/Samhain/All Saints’ Eve fast approaching, I’m dedicating this month (in addition to my 5K running practice!) to scary things. No Ghostbusters. No bats and pumpkins, but really really scary things. Inspired by the October darkness, I went through some of my favorite scary films to find my Top 5 Scariest On-Screen Monsters. Despite Jaws and my fear of great whites, I would still swim with sharks in one of those underwater cage setups, and would definitely go see dinosaurs at Jurassic Park. In search for truly scary monsters though, I have tried to select the ones that are in my opinion genuinely frightening on a much deeper level, and not because of jump scares or gore. 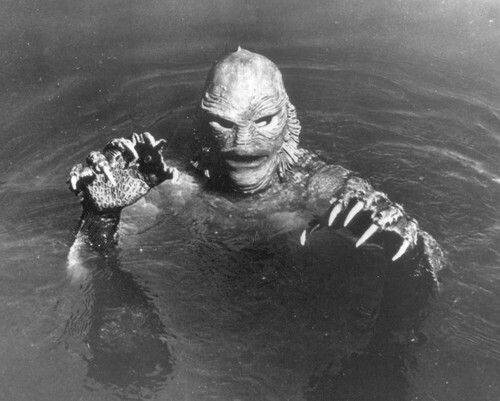 Since I’m doing a Top 5 only, starting tomorrow with Number 5 Scariest Monster, I’m going to throw in an old classic as warm–up: Creature from the Black Lagoon. Seeing this as a child, the Creature really frightened me. Unfortunately the film hasn’t aged that well; now the monster looks more and more just like a man swimming in a rubber suit. However, I read that Universal is producing a reboot which will supposedly hit theaters sometime next year under the title The Black Lagoon. Probably we can expect to see a much faster, darker version of the good old Gill-man. Before calling the Creature just a fishy stalker, let’s think about replacing him with Ariel from The Little Mermaid. 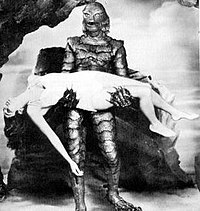 The odd similarity of their of fascination with humans, underwater lair and all, makes the Gill-man’s story in its essence a tragic tale of loneliness, unrequited love and sexuality with the Creature portraying an uglier, more violent form of longing compared to Ariel. Though he might not look that scary for the modern eye, there is something really disturbing and human in how he follows her both under the surface and on land, making him a compelling monster worth an honorable mention.